The OS upgrades have always been fruitful and so is Android Oreo, the widely trending Android 8.0 as compared to Nougat, with a list of intriguing features. By and large, software upgrades are always touted to be better than the predecessors, no matter what the end result would be. 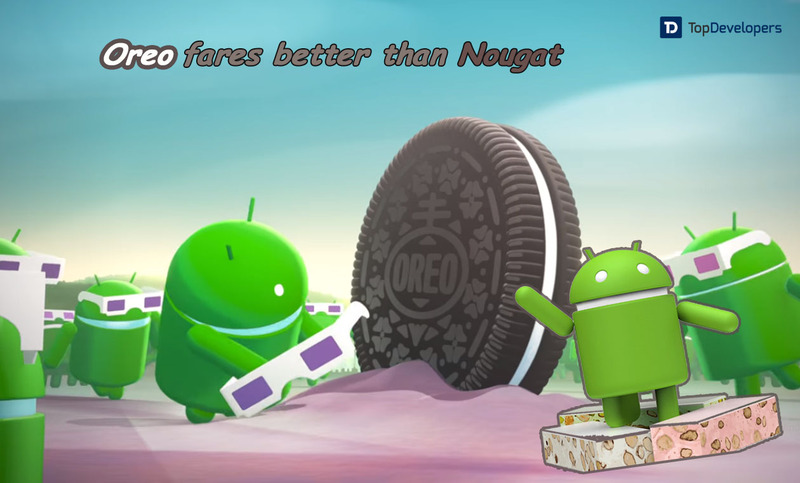 It’s true in the case of Android 8.0 as well.Yes, Android Oreo that made its debut to the world after Android Nougat has made it easier for the efficient Android App Development Companies and also improved the Android user’s experience. Android Oreo release has been amazing without a doubt, but still, there’s one thing that could make it more interesting. What’s that? It’s the major improvements that are packed in Android Oreo, which makes the latest Android OS release out do Android Nougat. Three major changes are brought to the notifications with Android 8.0 Oreo. The first change includes- the media control in the notification shade can change the background color as per the album artwork, and users are facilitated to snooze the notifications after a defined time limit when they partially swipe a notification to the left. Also, the partial swipe enables users to configure the notification behavior for every app with easy access to notification setting. Secondly, the notification dots which may remind you about notifications on iOS devices wherein the dots on any app’s icons signals that you have unread notifications.With a long press, users not just have access to the notification, while accessing the app’s shortcut become possible that allow users to read and respond to the message even without opening the app for once. Third, a notification channel that’s presumed to be the biggest change. Well, it is bigger in terms of helping the users to efficiently manage the huge number of notifications they are receiving from multiple apps. The channels allow the users to modify the behavior in a way, such that the notifications of every app will be displayed to them. For instance, the users can set the characteristics such as importance, sound, light, vibration, show on the lock screen and Override do not disturb for every app’s notifications, and thereafter the notification will be shown in the same way. Well, it’s wrong to say that background apps mainly kill the phone battery. The foreground apps are also battery killers when they continuously utilize the background services to execute the activity in the foreground. For instance, the multiplayer game app constantly checks what’s the highest score updated in the background and then show the same in the foreground. Thanks to the new update from Android 8.0 that’s background execution limits, which replaces the continuous background service with job scheduler where in the background service performs periodically as a job and then stops. The Job Scheduler schedules different types of the job that will be executed at the defined time. Besides, the addition of the few constraints restricts the jobs to run either when the device storage is low or battery is about to die. The latest Android release has sorted out the quality audio issue with which the developers and app users are suffering the most. The new Volume Shaper introduced some of the audio track transitions such as fade-in, fade-out, or crossfade in apps to facilitate audio transitions. The another Audio Focus Request introduced automatic background ducking that automatically quiets all the apps be it music or video which are running in the background without pausing or calling them to smoothly play the audio in the foreground. Both classes enable seamless audio track transition and audio playing from multiple resources and let the app gain more focus. The new methods of Media Player have provided better playback options for both audio and video. Also, the users are enabled to select the right Bluetooth audio codecs manually to not make any compromise with a high-quality audio option. To serve the purpose, the integration of Sony’s LDAC codec is done in the Bluetooth stack to improve the sound quality to the level which has been never before. The Autosizing Text Views and adaptive icons have brought excellent visual changes in the content to display on the Android devices. With Autosizing TextViews, the text size will automatically get adjusted (Expanded or contracted) according to the different screen sizes to fill the layout completely. The developers just need to define the maximum and minimum limit and then the text size will get automatic scales in between dynamically. Using adaptive icons, the launcher icons’ shape can be modified as needed across the system by throwing various masks to the icons. For instance, an icon may look circle on one device, square on another and squircle on the third one. The developers can implement the adaptive launcher icon in the mobile apps by defining 2 layers- one in the foreground and second in the background. Bluetooth low energy that’s designed to use less power allows Android apps to communicate with sensor-based devices and wearables. Bluetooth 4.0 has already made its way to the Android device market and in use, but a few months back Bluetooth 5 was announced which has not been yet available for all the Android devices. The Android 8.0 update has enhanced the BLE aspect by extending the support for Bluetooth 5.0, which provides high-speed and distance for BLE connections, but both cannot go hand in hand. Now, the developers can build the apps that can easily discover and get connected with Bluetooth 5.0 compatible hardware without any change in the code. Definitely, the introduction of the new features and major improvements are adequate to illustrate a few elements- ‘Why’, ‘What’, and ‘How’ Oreo is far better than Android Nougat. These are surely the reasons that you don’t want to hold fire for when the Android Oreo software update will be available for your device. Right? Get ready with your mobile apps with new android Oreo and enjoy the incredible benefits of Android’s latest upgrade.